Remote Phone Control has a nag screen. Standard License: Remotely control an unlimited amount of phones on any CUCM clusters. Licensed to one PC and user. Includes 3 years' support and upgrades. Does not include bulk features. Supports an unlimited number of phones and CUCM clusters. Professional License: Remotely control an unlimited amount of phones on any CUCM clusters. Licensed to one PC and user. Includes 3 years' support and upgrades. 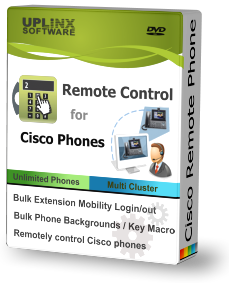 Includes all bulk features, such as CTL/ITL Erase, Extension Mobility in bulk, deploy background images, configure Cisco phone settings. Supports an unlimited number of phones and CUCM clusters. Enterprise License: Includes up to 12 Professional licenses for system integrators, RTU one year support and upgrades. The web-server edition of UPLINX Remote Phone Control is licensed based on the total number of phones configured on all CUCMs. CUCM clusters or users do not appear in the license. Annual software maintenance and support subscription ensures compatibility with new Cisco releases.